Some applications also allow to scan the shift registers in a so called "matrix" configuration. E.g. a 8x8 matrix (which is driven by a two DOUT SRs) can drive up to 64 LEDs, a 16x16 matrix could drive up to 256 LEDs. But normally 8x8 matrices are perferred due to higher duty cycle: 8x8 matrices make LED visible at 12.5% of the time which is normally bright enough, 16x16 matrices make LED visible at only 6.2% of the time which is mostly too dark!. Please note: due to historical reasons, the "first LED" is usually located at D7 of an output connector, while on a MBHP_DIN module the "first button" is located at D0 of an output connector. See also this Wiki page. This might be confusing, on the other hand changing these assignments for newer MIDIbox projects might confuse users even more! Therefore please bear with me that this assignment won't be changed anymore (it also has layout advantages)! Note: To reduce effort only the DOUTX4 variant is available at Mikes PCB shop and Modular Addict's MIDIbox Shop. If you don't want to etch the modules by yourself, just use the DOUTX4 and stuff just only the ICs which are really required. Note: a 16x16 LED matrix configuration leads to bad LED brightness - a 8x16 matrix configuration is recommended today! 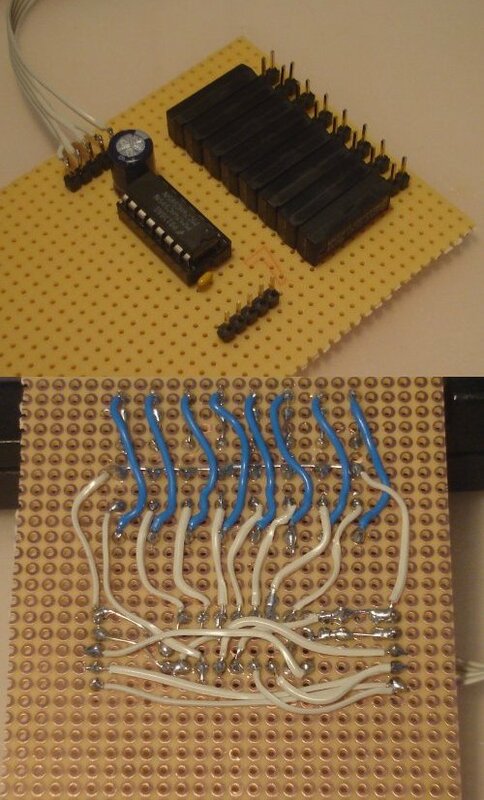 J1 5 Interface to CORE:J8 (if LEDs are used). DOUTX4:J1 provides two power pins for 5V/0V, the serial clock, the latch enable and the serial input of the register chain. This port can also be connected with J2 of another DOUTX module. The revised PCB layout from SmashTV uses a 2-row DIL Header instead to simplify the connection to the J8/9 connector of the core module. J2 5 Interface to another DOUTX4 module. DOUTX4:J2 provides nearly the same pins like J1, just only the serial input of the first IC is replaced by the serial output of the last IC. This port can be connected with J1 of the next DOUTX module. J3-J6 5 These are the digital output lines, every connector comes with 8 of them and an additional pin for ground. See mbhp_doutx4_32leds.pdf as an example how to connect LEDs to these pins, and mbhp_doutx4_ledrings.pdf how to connect LED rings. 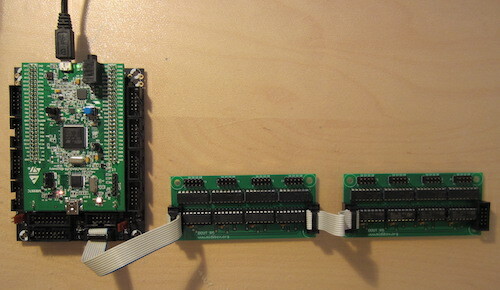 The revised PCB layout from SmashTV uses 2-row DIL headers instead so that buttons can be easily connected via 2-row DIL sockets. R1-R32 220 These resistors are required if LEDs should be driven with the output, just to limit the current through the LEDs. If you are using the DOUT module with a MIDIO128, and would like to drive additional logic chips instead of LEDs, these resistors are not required and can be replaced by bridges. C1-C4 100nF The additional bypass caps have to be placed on the bottom side of the PCB, as close to the +5V power input of the 74HC595 as possible. DIL SOCKETS Don't forget to buy sockets for the shift registers. 4 * 16 pin DIL sockets are required for the old PCB layout, resp. 4 2x5 DIL sockets for the SmashTV layout. This soldering guide explains how to build a DOUT module based on the revised layout from SmashTV. If you want to build a DOUT module based on the old layout (e.g. from Mike) please continue at this page. Continue with the 4 IC sockets. And then solder the resistors - here I'm using the nice 8x220 Ohm arrays (which look like ICs). Unfortunately they are only available at Mouser (652-4116R-1LF-220). Alternatively mount 32 discrete 220 Ohm resistors (not shown here). Thereafter mount the 2x5 SIL headers. As you can see, we are using "polarized" headers for J1 and J2, and DIL headers for J3-J6, so that the silkscreen (which shows the pin names) won't be hidden. It's your personal choice to use "polarized" headers for these connections as well. Finally put the 74HC595 ICs into the sockets. Your module is now ready for use! Two cascaded DOUTX4 modules connected to J8/9 of a MBHP_CORE_STM32F4 module with selfmade IDC cables. 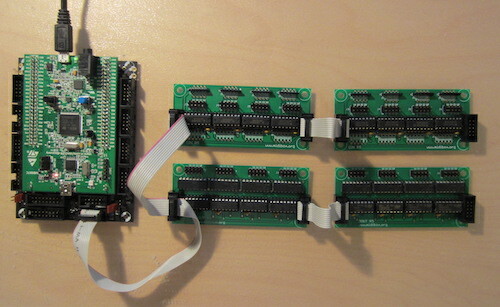 Two cascaded DINX4 and two DOUTX4 modules connected to J8/9 of a MBHP_CORE_STM32F4 module with selfmade IDC cables. This picture gives you a more detailed view of the special (selfmade) Y cable which has one additional DIL socket at the middle so that the DIN and DOUT chain can be connected to the J8/9 connector of the core module.